Energy & ClimateItem Depth: 1 Sub item of: What is Sustainable Clark? Reducing WasteItem Depth: 1 Sub item of: What is Sustainable Clark? Food, Water, LandscapeItem Depth: 1 Sub item of: What is Sustainable Clark? TransportationItem Depth: 1 Sub item of: What is Sustainable Clark? Recycling and CompostingItem Depth: 1 Sub item of: What is Sustainable Clark? The Massachusetts Executive Office of Energy and Environmental Affairs, Office of Technical Assistance and Technology (OTA) is the Commonwealth’s center for technical information and assistance to help businesses and other organizations improve their environmental performance as well as conserve energy, water and other resources. In fall of 2012, the OTA published their first case study of a non-business entity: Clark University. OTA case studies are meticulously researched and designed to illustrate environmentally responsible practices that can be implemented at other organizations. Clark University is proud to be included in the OTA’s case study database. The core campus is heated by steam and hot water generated from our central boiler plant. The steam is transmitted across campus through a network of underground pipes that service heating systems and radiators in 18 of our major campus buildings. Three high-pressure steam boilers capable of producing 41,800 pounds of steam per hour are located in the basement of Jonas Clark Hall. The boiler plant uses natural gas as its fuel source, augmented by waste heat from the cogeneration combustion exhaust. In addition to the steam-generating boilers, Clark University’s cogeneration plant produces 2,000 kW of electricity. Cogeneration captures “waste” heat produced in generating electricity as a source of thermal energy. In the Clark cogeneration plant, the waste heat comes from jacket water used to keep the engine at the correct temperature, much like the radiator cooling system of an automobile. The jacket water is used to supply a hot water loop that heats seven of the major buildings on campus, with the radiators in these buildings removing heat from the loop. In the summer months, the same underground water loop is used for chilled water from a chiller plant on the roof of Goddard Library as a way of air conditioning these buildings. The combustion exhaust from the cogeneration plant engine is also used as energy in the form of a waste heat boiler positioned between the engine and the exhaust stack and feeds steam into the main power plant. Heating and cooling are controlled through fully-monitored, centralized energy management software. A network of temperature gauges and sensors provide real-time data. Interior building temperatures are adjusted automatically and overseen manually to ensure occupant comfort and thermal energy optimization throughout the core campus buildings in accordance with policy. Clark University policy is to set temperatures at 78 degrees for cooling, 68 degrees for heating and 130 degrees for domestic hot water. During the heating season, the temperature in residence halls and houses will be set at 68 degrees during the day and 65 degrees at night. Academic and office buildings will be set at 68 degrees during the day and 62 degrees at night. Unoccupied buildings, which are buildings not in use, will have a temperature of 55-60 degrees at times such as semester breaks and any holidays numbering three days or more. The daytime temperature setting refers to 6:00 a.m. to 5:00 p.m. on weekdays for academic and office buildings and 6:00 a.m. to 10:00 p.m. for residence halls and houses throughout the week. During weekends and holidays of two days or less, temperature for office and academic buildings will be set at 60 degrees. Clark takes deliberate action to reduce thermal energy consumption on campus. The Lasry Center for Bioscience, which has been awarded Gold LEED certification, utilizes “heat wheel” technology in the mechanical design. Air-lock doorways in many campus buildings reduce heating and cooling losses. Campus buildings not on the central plant steam heating loop have energy efficient boilers, while domestic hot-water heaters across all of campus enable the University to operate in September and October without starting the main boiler plant. Integration of energy efficiency improvements into all renovation projects on campus facilitates improvements. For additional information on campus thermal energy improvements, please see the Sustainable Clark dropdown tab. 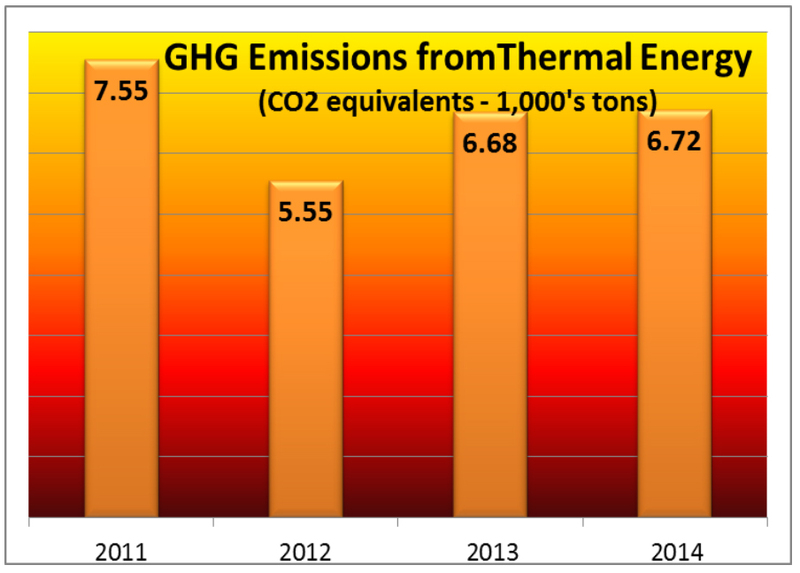 NOTE: The following information is from Clark’s first Greenhouse Gas Inventory in 2007. For current information, please see the Emissions Update, published annually, and available in the Sustainable Clark drop-down tab..
Anthropogenic emissions of carbon dioxide and other greenhouse gases are the dominant factor contributing to the rapid, unprecedented, and accelerating changes in the global climate that are occurring. An inventory of Clark University’s greenhouse gas emissions is an important step in assessing the environmental impact of the campus and in identifying areas and activities with a high environmental impact that could be targeted for reduction. The Clark University Environmental Sustainability Task Force completed a baseline multi-year greenhouse gas inventory in 2007 using the Greenhouse Gas Emissions Calculator developed by the nonprofit organization Clean Air Cool Planet. The calculator multiplies measures of energy use, agriculture, refrigerant use, and solid waste by emissions factors to determine the amount of metric tons of carbon dioxide equivalent (MT CO2e) added to the atmosphere by campus operations. The six greenhouse gases considered in this calculation are those included in the Kyoto Protocol: carbon dioxide (CO2), methane (CH4), nitrous oxide (N2O), hydrofluorocarbons (HFCs), perfluorocarbons (PFC), and sulfur hexafluoride (SF6). Of these six, CO2 (produced during the combustion of all fossil fuels) and HFCs (gases that are used in refrigerants and air conditioners) have been shown by this inventory to be the primary gases emitted on campus. CH4 and N2O emissions are primarily associated with agriculture, and PFCs and SF6 are primarily associated with industrial emissions not relevant to Clark. The scope of this initial inventory includes greenhouse gas emissions for three calendar years, 2004 through 2006, derived from heat energy, generated electricity and heat, purchased electricity, solid waste, and refrigerants. The major sources of greenhouse gas emissions are the operation of our steam heat boilers and the cogeneration plant, as well as the operation of power plants generating the electricity consumed on campus. Data on fossil fuel use in the operation of the boilers and the cogeneration plant, along with data on electricity consumption and estimates on the fuel mix used in generating electricity in this region, are converted in our emissions calculator into metric tons of carbon dioxide equivalent. Between 2004 and 2006, total (gross) emissions decreased by 9.6 percent, from 14,155 MT CO2e to 12,802 MT CO2e. The decrease is largely explained by reductions in thermal energy use throughout the period as well as the reduction in electricity consumption in 2006. To understand the observed reduction in total emissions in greater depth, it is helpful to assess emissions by each source. This is made possible because the Greenhouse Gas Emissions Calculator allocates proportionally the emissions from the cogeneration engine to its two outputs, heat energy and electricity. The graph displays total electricity emissions (emissions from purchased electricity and cogen electricity) and heat emissions (from steam heat from the boilers and steam and hot water from the cogen engine). Refrigerants, while in the graph, were not considered in the analysis here given their relatively small impact. Between 2004 and 2005, total emissions dropped by 2.6 percent. The reduction is the net result of a 15.2 percent reduction in heat emissions (1,562 MT CO2e) and a 25.5 percent increase in electricity emissions (930 MT CO2e). Heat emissions fell due to a 7.6 percent reduction in heat use in 2005. Heat emissions were also reduced due to a greater reliance on the boilers for heat in 2005 when the cogeneration engine was taken offline for six months. The boilers are more carbon efficient (averaging 229 lbs of CO2e per MMBtu) than the cogeneration plant with regard to producing heat (averaging 400 lbs of CO2e per MMBtu). This is because the waste heat boiler currently attached to the cogen engine is too small to capture the bulk of the exhaust heat. In other words, the heat benefit of the cogeneration plant in not maximized with the current setup. Electricity emissions increased as the result of a 5.0 percent increase in electricity consumption in 2005 and because more electricity was purchased while the cogeneration plant was offline. Purchased power is less carbon efficient (averaging 1 lb. 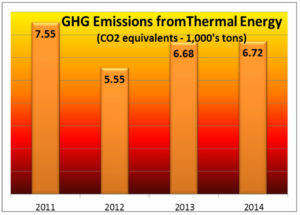 CO2e per kWh) than the cogeneration engine (which averages .6 lb CO2e per kWh). Between 2005 and 2006, total emissions dropped by 7.2 percent. The reduction is the net result of a 19.3 percent reduction in electricity emissions (885 MT CO2e) and a 0.6 percent increase in heat emissions (55 MT CO2e). Electricity emissions reduced due to the 2.5 percent reduction in electricity use in 2006 and because a greater portion of electricity came from the cogen engine. In 2005, 43 percent of the total electricity used on campus was generated by the cogen engine. In 2006, that percentage increased to 90 percent. In other words, the amount of carbon dioxide equivalent emitted to produce a kWh of electricity is reduced as the cogen engine is used more. Heat emissions increased slightly, despite using 6.6 percent less heat, because a greater amount of heat was supplied by the cogen engine rather than the boilers. Based on the baseline inventory performance regular use of cogeneration in the current configuration contributes more greenhouse gas emissions than would occur if Clark purchased all of its electricity and used the boilers to generate all the needed heat. Although electricity generation through the cogen engine is more carbon efficient than electricity supplied through the grid for our region, the generation of steam heat and hot water during the last three years was far less carbon efficient than the on-campus boilers. While use of the cogen engine during this period has presented substantial financial savings, the underutilization of the waste heat effectively rendered the operation more carbon intensive. In addition to capturing emissions data, the calculator highlights greenhouse gas offsets resulting from different activities. In 2006, the Clark Sustainability Initiative, a student group focused on environmental sustainability issues, coordinated Clark’s first-ever student purchase of futures for renewable energy certificates (RECs) through the New England Wind Fund. Someday, these monies – currently in escrow – will deliver at least two hundred MWh of wind power onto the New England grid. The manner in which Clark’s solid waste is handled acts as an offset. The daily trash from campus is hauled to a Mass Burn Incinerator in Millbury, Mass. In this version of a waste-to-energy facility, the heat energy from the burning trash powers a turbine that produces electricity. The process produces less greenhouse gases per unit of electricity than a conventional, fossil fuel power plant. By routing the waste stream through such a system, 56 MT CO2e were offset in 2006. The slight decrease over time is the result of reductions in trash tonnage generated on campus. By deducting the offsets from total emissions, we find the net emissions for the campus. These net emissions effectively capture the impact of both regular campus operations as well as emissions reduction measures. During the period of 2004 through 2006, net greenhouse gas emissions fell from14,093 MT CO2e to 12,746 MT CO2e (9.6 percent). As discussed in the review of the Presidents Climate Commitment, the University’s ultimate goal is to achieve climate neutrality, or zero net greenhouse gas emissions from campus activities. Most electricity in the United States is generated from fossil fuel-based power plants. The burning of fossil fuels to generate electricity produces greenhouse gas emissions and also generates significant air pollutants, such as particulate matter and sulfur dioxide. Electricity used at Clark University is purchased through National Grid and includes renewable sources as well as fossil fuel resources, or is generated by the natural gas powered 2000 kW generator in the cogeneration plant. By reducing our consumption of electricity we both reduce greenhouse gas emissions and pollution, and save money. A commitment to continual efficiency upgrading impacts our electrical energy use. Upgrades to lighting technology, the addition of occupancy (motion) sensors, improved variable frequency drive motors, exterior and interior LED’s are a few examples of recent electrical energy upgrades. Steam heat has replaced electric heat in several buildings, while use of space allows for greater lighting efficiency. Newly purchased equipment and appliances are Energy Star rated where applicable. All new Clark computer and copy equipment comes programmed for sleep mode. Managed programs of regular maintenance on refrigeration and other high-volume equipment improve our operating efficiency. Clark continues to explore both technology, strategies for efficiency, and usage patterns to conserve energy. (Please see an updated list of energy improvements in the Sustainable Clark drop down tab). However, no amount of technology can substitute for appropriate human behavior in conservation strategies. Turn off lights when you leave a space – unplug all appliances, chargers and equipment when not in use – close fume hoods – follow appropriate guidelines for computers in sleep mode – de-bulb unnecessary overhead lighting or better yet use a desk lamp. You have the power! Clark’s on-campus cogeneration plant, located in the power plant below Jonas Clark Hall, allows the University to generate electricity, steam heat, and hot water from the same fuel source. Waste heat produced in generating electricity is efficiently captured and reused. In January 2013 the University brought online its new cogeneration engine, replacing an engine that was installed in 1982. The new and more efficient engine provides more electricity (2.0 MW versus the previous 1.8), while still providing steam and hot water through existing distribution lines. The new engine is clean and efficient, with much lower greenhouse gas emissions and particulates. The fuel source is natural gas. National Grid provided incentives that contributed significantly to the cost of installing the new engine. Ground-breaking in its time, the Clark Integrated Community Energy System (ICES) still serves as a demonstration model for potential cogenerators—and for energy policy makers—of the benefits to be gained from such plants. One fuel source serves multiple needs, reducing fossil fuel by up to 50% and providing benefits from both a financial cost and environmental degradation perspective. Such dramatic savings are made possible by a process that uses fuel—in this case natural gas—more efficiently than it is used in the production of electricity at a utility plant. In a typical central station utility plant, 35 percent of the energy produced by burning fuel becomes electric power, but 40 to 45 percent is rejected as “waste” or by-product heat. Utility plants normally dispose of this waste by “dumping” it into a nearby body of water. Another 20 percent is lost up the smokestack of the boiler (or, in the case of nuclear processors, through the condenser). In the cogeneration process, on the other hand, most of the thermal energy normally rejected as waste in central utility plants is recaptured and used for space heating (or air conditioning) after it has been used for electrical generation. In the Clark system, energy from the input fuel is converted directly into electricity and “waste heat” is recaptured from the engine’s exhaust and surrounding cooling jacket to be used for heating and hot water. Thus, the cogeneration system uses the original fuel nearly twice as efficiently as it would be used elsewhere in the utility system. The engine and generator operate to supply core campus load, except during regularly scheduled down time for maintenance and a few periods of low thermal demand. From May to September, the heat recovered from engine exhaust, along with the use of independent domestic hot water equipment, allows Clark to shut down its existing boiler plant. During this period, some of the recovered heat is dissipated in a cooling tower on the roof of the library. During the heating season, exhaust heat is captured in the form of 125 pounds-per-square-inch steam and is supplied to the university steam system. Heat is also recovered from the jacket water and lube oil and is use to heat Goddard Library, Jefferson Academic Center, Geography, Jonas Clark, Math Physics, Lasry Center for Biosciences and Blackstone Hall. On cold days, this heat is supplemented by the boiler plant. The origins of our cogeneration plant lie in the campus community response to a decade of high energy prices during the 1970s. Students in the Science, Technology and Society program, a precursor to the current Environmental Science and Policy major, initiated the idea of installing a cogeneration plant. A planning team was formed that also involved representatives from the local utility, New England Electric, and the group received a planning grant from the federal government. Construction began in 1980 for what became one of the first grid-connected cogeneration plants in the country. Mass. Electric Construction Company of Boston served as the principal contract manager for the project. Energy Services Management Corp. of Boston designed and specified the cogeneration system; and the Aldrich Co., Inc., Cochituate, Massachusetts designed the 1½ story building that houses it. The first engine/generator set was built by Fairbanks Morse Engine Division, Colt Industries, Beloit, Wisconsin; and switch gear was designed and built by Russelectric Inc. of Hingham, Massachusetts. Commonwealth Gas Company serves as the system’s supplier of natural gas. From the outset, the project had financial support from the Department of Energy, and received a $1.2 million loan through the Department of Housing and Urban Development in addition to outright grants from the George F. and Sybil H. Fuller Foundation and the Wyman-Gordon Company, both of Worcester. The cogeneration engine, originally designed for use in a submarine, was in use until late spring 2012. During its first quarter-century of operation, the plant produced approximately 197,000 million BTUs of steam heat and 114,000 million BTUs of hot water for the campus, alongside the electricity generated. The older engine was dismantled and removed in fall of 2012 after 30 years of faithful and sustainable service. Its parts were recycled. As a country that has underutilized the cogeneration process, the United States might benefit dramatically from encouraging emulation of the Clark model. For every 45 minutes that the Clark cogeneration system is operating, it saves the equivalent of one barrel of oil. If similar cogeneration processes could be used to produce one half the electricity currently gathered in the United States by oil and gas, the savings nationally would amount to more than 1.5 million barrels of oil in a single day. For a detailed history of Clark University’s involvement in energy efficiency see DeCarolis, J.; Goble R.; and Hohenemser, C. 2000 “Searching for energy efficiency on campus” Environment 42: 4 9-20. Clark University has obtained Gold LEED certification for the Lasry Center for Bioscience building and Silver LEED certification for Blackstone Hall.